Observed in North Bay, Ontario, this bird is one I would like to identify. Comments for Can anyone identify this bird? I had a pair of Evening Grosbeaks feeding in our bird feeder. I had never seen such a bird before and only identified it by this site. Thank you for helping me identify them. You're most welcome - this website is my hobby and I enjoy adding information to it each week! This is a male Evening Grosbeak that has been photographed in Algonquin Park, therefore not too far from North Bay and I have identified it a few kilometers north of Sudbury, Ontario. I saw one like that in Newfoundland, Canada took a picture. This bird in definitely not an Oriole, as I have Orioles at my feeder regularly, and they are orange, bright orange, in color with black. Sure looks like an Evening Grossbeak to me. 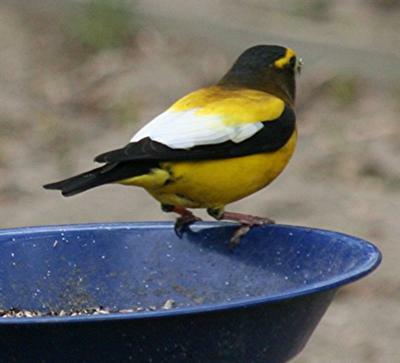 This bird is an Evening Grosbeak. I have been just dying to get a picture of one to add to my "bird catalogue" I have yet to see one in the wild. The bird in the pick is an Oriole.